After a wonderful Thanksgiving break (made more wonderful by the Eagles win over the Cowboys! ), it’s the 3-week sprint to the holidays, followed by 2 full weeks before final exams. There’s a lot of stopping and starting going on, which doesn’t help continuity when thinking about class content. In my AP Stats class, we are deep into our unit on experimental design, which is filled with ideas, terms and arguments must different than a traditional math class. Groups are working through their “Old Wives’ Tales” project, and after grading some student responses this weekend I need an opener which brings the whole class back into the Stats circle. My friend Glenn Waddell has some awesome resources for statistics on his website, which provided inspiration for today’s opener – a short video from ABC News featuring the placebo effect. Treatments: WYFFT is not a “real” drink, it’s just soda. Students conjectured that the labeling and associated signage were the actual treatment. We can compare this vs a plain bottle, or against no drink at all. Matched-Pairs: could subjects plausibly participate in both treatments? Is this reasionable? Blocking: could the implied reaction be different in men than in women? Perhaps we should have two different experiments? Response: what exactly are we measuring? What would be a suitable activity to measure a change in energy? Randomization: how will subects be selected for the treatments? And we are off and running after a long turkey-induced rest! Class Opener – Day 55(?) – Can We Just “Guess and Check”? I’m a little off schedule with the class openers lately, so we’ll call this one day 55. There have been a few schedule disruptions here at school, and I was out yesterday – presenting on Standards Based Grading in Algebra 1 at the PASCD conference – on top of all of that, the dog ate my homework…..OK, enough excuses! Today really isn’t a class opener, but rather a summary of some goings-on related to math persistence – those times when you give your students a problem which will require more than a one-time effort, and observe their response. Jon Orr, a teacher from Ontario, shared the poster shown here on twitter, and I love it! If you aren’t following Jon, do it now, and be sure to check out his blog with lots of great classroom ideas, mostly for Algebra 1. When I was out yesterday, my students had two tasks to complete: work through problems as review for their quiz on matrices today, and complete a “problem solving” task involving matrices. 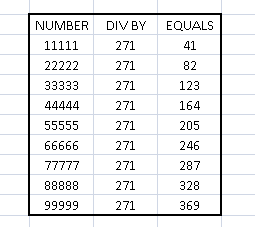 In the task, which you can download here, students are asked to find a matrix which is its own inverse, with a few restrictions. The group clearly found a matrix which is its own inverse, but am I confident that they could generalize and perhaps find more? And are those “random numbers” they started off with actually random, or do they signify the end of a process which has not been communicated? I find that this is typical of a problem-solving process for many students – begin with some “random” numbers and hope that they lead towards a fruitful path. Hey, what’s the matter with good old “guess and check”, if the question at hand is answered? I don’t have a problem with this “brute force” method IF the process leads to a generalization, which this paper did not. I struggle with having my students move from “I got an answer” and towards “hey, now I see how this REALLY works”. All is not lost, however, as some students thought about variables and attempted to generalize, but then opted to plug and chug. I’m looking forward to the group conversations we will have in the coming days surrounding this problem. Tonight for homework I assigned a problem involving a wire being streched around the earth. Within 60 seconds the first all familiar call was heard: “I don’t know what to do!”. A sly smile from me and pointing out today’s quote sent the message that this cry wouldn’t get them off easy…it’s a hard-fought battle to get kids to move past theiur initial blockades and think. 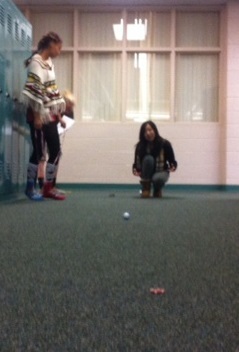 In hallway bocce, students place two poker chips 5 meters apart in the hallway. Then, standing behind one of the chips, they roll a golf ball towards the opposite chip, trying to get as close as possible. 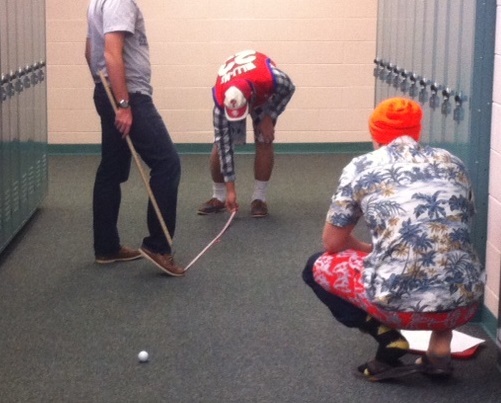 With our carpeted hallways, the golf balls really take off, so some practice is needed to get the right touch. 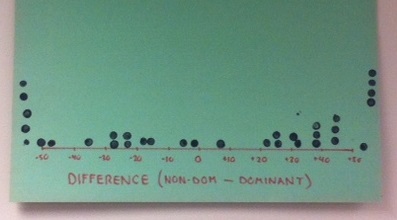 During this practice session, the students don’t know where this is all heading in terms of experimental design. Next, the students are given a direction sheet for recording results. Each “stat-lete” is asked to play bocce 4 times, twice with their right hand, twice with their left, alternating hands. A coin is used to determine which hand to start with. Partners then measure their attempts and record results. Note that today was “fashion disaster” day as part of our school’s spirit week. But this only allows us to compare hands in general. What we’d like to be able to do is determine if players are better with their dominant, rather than their non-dominant, hands. 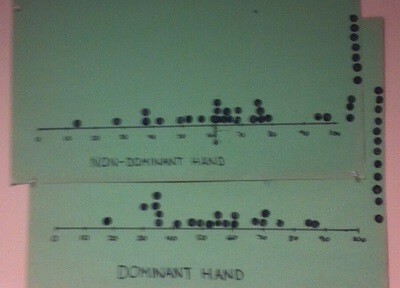 Subtracting these results, since all players participated in both treatments, allows for this comparison. In the end, those reasults seem quite inconclusive, but that’s okay! Not all experiments prove conjectures, and we learn about the process. It’s day 3 of codebreaking openers, and time to up the ante! After offering Jolly Ranchers (who should provide me stock, with all the great pub I give them in my classroom) and candy bars for codebreaking challenges, we’re ready for the big time…. Wait…do my students not trust me? Well, I suppose my students have good reason to NOT trust me, as it’s not everyday practice to hand out gift cards for solving problems. But the cell phones came out, typing in the phrase with faint hopes of Googling an answer. Many students had questions about yesterday’s code – a Hill cipher – wanting to know how letters become numbers, and great questions about the role of inverses. And while I gave very few clues about today’s challenge, I assured them that it was NOT done with a Hill cipher – something much more complex is going on. I was feeling a little generous (just a little), and left a small clue on a side board for them to consider. But just how helpful is it? What are rotors? And what’s with the Roman numerals? Just a small clue that today’s challenge was coded using an Engima machine – or at least an online applet simulation of one. This is a challenge I have done before, and for the last 12 years, and have yet to give out a gift card. This is the first year I have given out at least a little information – rotor positions – and I am still supremely confident that my message will not be broken. 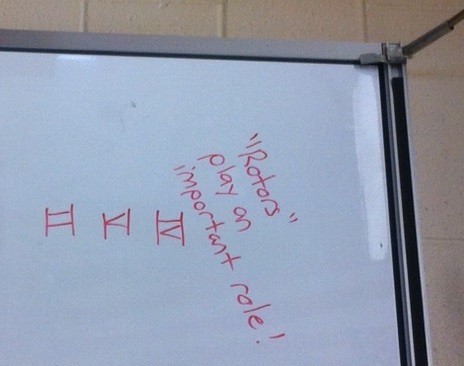 I’m giving away some of the explanation, but I am not worried – unless my students are REALLY persistent. While classwork was done today, many students had great questions about the problem, finding ideas on their phones (which I endorse!). And I admit I started to get a little nervous when I saw a photo of an Enigma machine on one phone. Am I tempting fate? We’ll find out by tomorrow. Class Opener – Day 51 – Codebreaking Continues. How many words is that? How did you code it? What do I do? This is definitely a much trickier challenge than yesterday. The only hint I offered is that the original message was two words, 12 letters total, and that some extra information would be coming later in class. This extra information came when we began our notes on matrices, where we talked about the constant need in math to “undo” an operation. So if we multiply matrices to obtain a product, we can use an inverse matrix to undo the operation. Slyly, I then offered that if I were to (hypothetically) convert a message into numbers, arrange it into a matrix, then multiply it by a secret matrix, then a cunning student could undo my work by considering the inverse. Clearly this isn’t much of a hint, as there are an infinite number of coding matrices to consider. But take a look at that original photo again….what’s that matrix lingering in the darkness? To code my message, this matrix method (called the Hill Cipher) was used, and my coding matrix was provided all along. 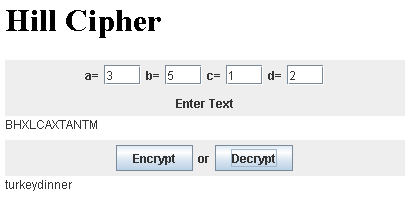 This still provides a challenge to students who are new to inverse matrices, but before we departed I did show my class a Hill Cipher applet which I used to code my message, and which verifies the original message. Tomorrow we’ll take another look at this cipher method, and try some of our own with a puzzle I have created. By the end of the week, expect the Enigma to make an appearance for a final challenge! Class Opener – Day 50 – Codebreaking Begins! From now until Thanksgiving, my 9th grade classes will be working through a unit on matrices. This unit starts off innocently enough, with procedures for adding, subtracting, multiplying – even finding the inverse. But we then move on to challenging ideas, like translating a system of equations (including those with 3 or 4 variables) into a matrix equation and using inverses to solve. Cramer’s Rule will also be included next Monday, with a step-by-step packet I wrote a few years back. By the end of the week, we will also touch upon the Hill Cipher – a codebreaking method which utilizes matrices – with some class challenges upcoming. 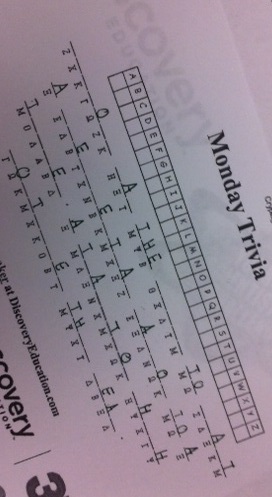 To set the theme, students were handed a cryptogram to work on as homework was checked. 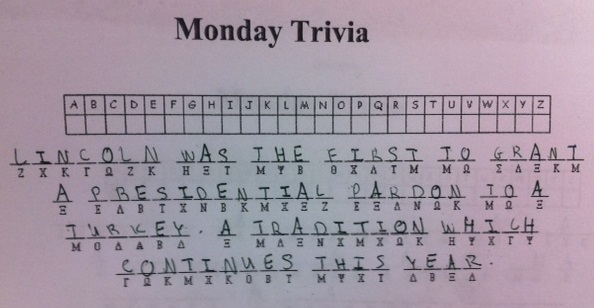 The puzzle was made using Discovery Education’s Puzzlemaker, and I offered Jolly Rancher prize to anyone who could decode the message (which involves presidential turkey pardons!). Some students had experience with these puzzles before and dove right in, helping others in their group who were not so sure. To make the puzzle a little more challenging, the cryptogram does a 1-1 replacement with letters from the greek alphabet. Soon, some students began to piece through many of the clues. That 1-letter word which appears? That must be the A (unless it is I). The word THE probably makes an appearance, and we can leverage some thoughts about letter distributions to conjecture the replacements of E and T, and thus get THE to appear. Eventually one of my groups was oh so close to completing the phrase, and my gentle nudge that I bet they could finish it “by Thanksgiving” gave them the one final word – TURKEY – which eluded them. Later this week, I look forward to sharing stories regarding the Hill Cipher, and the Engima machine. In a summer program I once mentored with friends at LaSalle University, we taught students how to perform a freqeuency analysis on coded text using Excel. The challenges became more difficult during our time together, and culminated with a coded passage from the story Gadsby, by Ernest Vicent Wright. This story is unique, and frustrating to amateur cryptographers, as the text does not contain the letter E anywhere. This is also an exciting time to consider cryptography in your classroom, with the soon release of the movie The Imitation Game. The movie tells the story of Alan Turing, a British mathematician credited with breaking the Enigma code during World War II. I have only seen the preview thus far, and am hoping the movie will be appropriate to share with classes down the road. You can view a preview for the Imitation Game online. Class Opener – Day 49 – A Magical Prime? What’s going on here? Is it just plain coincidence? Dumb luck? The devil’s work? 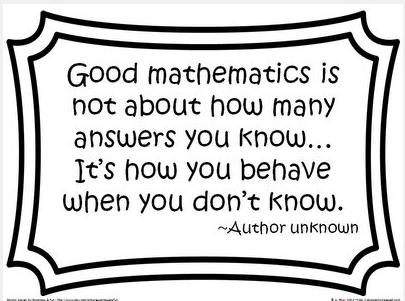 37 is certainly not a number we encounter too often in our daily math life. They are pretty easy to find, such as the one below for five-digit strings. 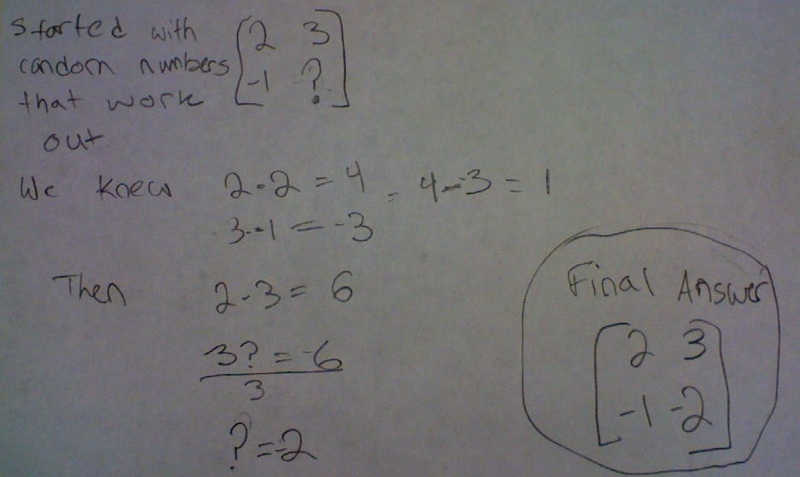 And Chris provided a low-stress math challenge to get us into math thinking mode before our quiz.